Creamy Vegetable Dip — Pip and Ebby - easy, delicious recipes! Being unable to wear mittens that I have left in the car because that is far colder than bare-knuckling the freezing cold steering wheel. Not ever being able to fully warm up my very old yet reliable car and curling my toes for added warmth everywhere I drive. Wearing the following items of clothing everywhere I go: knee-high socks, leggings, jeans, knee-high winter boots, 2 long-sleeved shirts, scarf, winter coat, mittens. At least the Super Bowl is just around the corner! We can stay in our warm home, eating comforting food with friends. Comfort at its best! Here is another party staple for your own Super Bowl party. Dan and I thought up this dip last week and we both adore the texture and flavor that the veggies add to the creamy base. We will make this again and again! Pulse until the vegetables are finely chopped. Stir until creamy. Add the vegetables to the sour cream mixture and stir until combined. Refrigerate until ready to serve. Serve with fresh vegetables or crackers. Enjoy! I hope you are warmer than I am right now! This cold, creamy dip is packed with nutritious veggies! 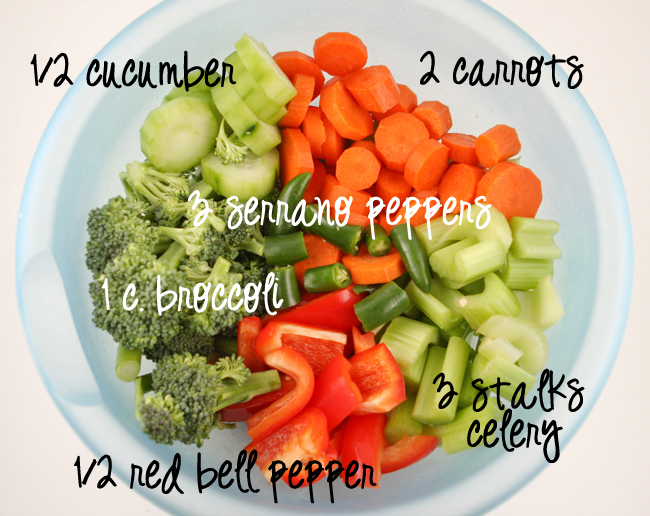 In the bowl of a food processor, combine the carrots, bell pepper, cucumber, celery, broccoli and Serrano peppers (if using). Pulse until veggies are finely chopped. In a large mixing bowl, combine the sour cream, cream cheese, mayo, lemon juice, salt and pepper. Stir until creamy. Add the veggies and stir until combined. Refrigerate until ready to serve. Serve with fresh vegetables or crackers.